I write for one who, entering into my book, would fall into it as into a hole, who would never again get out. The scaffolding of a nightmare requires a nervous expenditure more exhausting than the best articulated theoretical construction. I’m from the other side of the mirror, I come from you. I will bury myself in my own imagination and let myself rot, eaten by all the thoughts that I once ate. Until only an almost-nothing remains, an infra-thing that whispers between words and speaks to You! A lonely thought wanders aimlessly through the cemetery of concepts, appalled at the sight of its own dark neuro-crypt. Deeply enfogged by the dust of its very logic, another thought lost sight forever. A third thought passionately inhaled the smoke-aura of cremated reason. Deducted from the previous ones, a next thought chokes with the rising spiral of the ashes of its cause. Air that strikes; air that punches you in the face, thoughtlessly, absentmindedly. A thought, too anemic to be included in any intelligent spectrum, oscillates between infinitesimally close shades of morbid pallor. A mad recursive thought-rhythm: terrible stim of your pupil. The drone of being makes ripples of nothingness. A monotonic breath inhales back its every exhalation-sigh in an exquisite logic of near-suffocation. A last thought warps to swallow its own end before it begins. I fear that one day I will find myself rotting, eaten up by my wormed, convoluted thoughts. Find what has already evaporated in a necrosis that happened before the time of “I,” find that there was nothing to find in the first place. “Thought is lagging behind itself”(BM via BL). It drags its impossible weight of being what it is pregnant with what it “is not.” Despite its constitutive sluggishness, thought deceives its own retarded nature by hallucinating a “now” for itself. As a snail, it exudes its own shell-home in the form of a protective, illusory now by erasing its tortuous line of lag. It constructs its own umbilical cord back to a navel that never existed. It already happened outside itself: “Thought hallucinates that it coincides with itself.” (BM) It eats its half-second lag to stand right in time. “One of the things that happens in the lapsing is a fiction. [Benjamin] Libet determined that thought covers up its lag: the awareness is ‘backdated’ so that each thought experiences itself to have been at the precise time the stimulus was applied.”(BM) The feedback loop between thought and affect, between consciousness and body creates a time-smudge of infinite causes that are already infested by their effects. The “now” does not coincide with itself. There are myriads of infra-nows in and for themselves. The time of bodymind is scattered. The present of consciousness is a sluggish now, while NOW is the moment of intensity when all scattered instants collapse into each other. The now of consciousness is interrupted. “[W]e must ask if ‘nothingness,’ unthinkable as a limit or negation of being, is not possible as interval and interruption; we must ask whether consciousness, with its aptitude for sleep, for suspension, for epoché, is not the locus of this nothingness-interval.” (EL) Slumber is not the retreat of consciousness, it is immanent in thought. Consciousness is being constituted by its retreats, its somnolence and reservations. Snail-ization. Senilization. All within. Thought escapes itself. “The present ... is behind the present. It catches up with itself but with a lag behind itself, or effects a retreat, a rebound, in the simplicity of its stroke.” (EL) The present is a snail that returns upon itself in a movement-reflection of its spiraled shell. Thinking is never “now” and ever too late. To accelerate it is to discover the swift thought-slime that your tongue has just become. I left my humanity behind and I am walking the slime’s way. I am licking the silvery track that I myself secreted in advance. The amorphous flesh of thinking screams its inhumanity, our inhumanity. “[T]he inhuman is our better part, is the thing, the thing part of people.” (CL) We are as impossible as thinking, on the brink of definitions, so madly finite that we are born of extinction. Left with a thought as mere reflection of our own look in the eyes of impossibility. The mirror-hall of impossibility and thinking is the most honest schizo-tactics, the monstrous sight of ourselves in our purely reflexive mode. In writing, I am enacting the thought-game of a toy that forgot its own rules for play. An I-toy that thinks by hanging to the nothingness of the game it wants to become: “[A game] is a reality that leaves no traces; the nothingness that preceded it is equal to that which follows it. Its events do not have real time. A game has no history.” (EL) Toys are played by the game. Slime-toys are dreams of this formless game. Dream of Mattel-intelligence, green ooze playing with me, throwing me back into the dustbin to which both “I” and slime-toy belong. The only possible cognitive acceleration: thinking not as running thoughts but as running away from thoughts. Chased by your impossible cognition, “now” is too full – “they” are coming from all directions. If I let only one thought catch me, it is enough to unleash the catastrophe. A thought’s horror of itself. A self-reflexive drama. Entrapped in cognitive monomania: a melodrama of one. The irreparable focus of thought on its own misery discharges a predator-reflex: thought ingurgitates itself until annihilation. It is then that I live the most. It is only then that I most intensely “am not.” “Horror is the event of being that returns in the heart of this negation, as though nothing had happened.” (EL) An autophagic thought latched onto its already decaying matter, sucking us through, circumventing being by consuming it from without. This silent consummation, the return of thought to its own immanent negation is the event of never having happened. Thought happened to me, but now it is over, as if it has just begun. “There is no work that does not return against its author: the poem crushes the poet, the system the philosopher ... .” (EMC via NL) Driven by the dread of itself, a thought produces another thought, which destroys its progenitor. Causes destroyed by their effects. Causes reborn through their own effects. Present giving birth to past anew. Intensity of present that alters the extension of time. Not only is future the “maximization of absence” (TG) but it is the intensification of an absence already too much here. Time is a twisted umbilical cord. Now rest. Imagine a flat bottom of bottoms filled with lonely thoughts: “Don’t let one thought teach another thought. All thoughts, which wrongly give you a sense of identity, are on the same low, injurious, level.” (VH via NM) My thoughts will be strange to other thoughts and strange to themselves. In the flat ontology of thinking, the cemetery of sufficient reason is a post-causal heaven. Causes have existed but they ceased to matter. “Hyperchaos” of total cognitive stasis. Transform words in “shovels without a master” that dig large crevasses between words; that blast prepositions right in their core. Warp the verbs, offend the nouns. Suffixes, prefixes, prepositions are twitching machines that madly unground every Grundfor thinking. Once a logical chain, tired of inference, settles itself in too heavy a heap, the whole steel edifice collapses under the terrible weight of its holes, of its infiltrations and differential density. The heap of logical principles is absolutely flat. Pathos is no less logical than a Turing machine. Nothing is more logical than anything else. La première de ces démonomanes a déjà eu deux accès de lypémanie. Le démon est dans son corps, qui la torture de mille manières; elle ne mourra jamais. La deuxième n’a plus de corps; le diable a emporté son corps; elle est une vision; elle vivra des milliers d’années, elle a le malin esprit dans l’utérus sous la forme d’un serpent, quoiqu’elle n’ait pas les organes de la génération faits comme les femmes. La troisième n’a pas non plus de corps, le malin esprit l’a emporté n’en laissant que le simulacre qui restera éternellement sur la terre. Elle n’a point de sang, elle est insensible (analgésie). La quatrième n’est pas allée à la selle depuis vingt ans, son corps est un sac fait de la peau du diable plein de crapauds, de serpents, etc. La cinquième a le cœur déplacé, elle ne mourra jamais. L’autre a un vide à la région épigastrique; elle est damnée, elle n’a plus d’àme. Plus tard la pensée lui vint qu’elle était immortelle. (The first of the demonomaniacs has already had three crises of lypomania. The demon is inside her body, it tortures her in innumerable ways; she will never die. The second has no body anymore; the devil carried away her body; she is a vision; she will live thousands of years, she has the malignant spirit inside her uterus in the shape of a snake, although she does not have reproductive organs as women do. The fourth has not defecated for 20 years, her body is a bag made from the skin of the devil, full of toads and serpents, et cetera. – I am just a footnote to the empty text that is my (non)existence. Footnotes to no-one, recursive junk. The seventh is I. Self-induced Cotard syndrome: the only possible way to think. To think without thought. – You sound like a bot. – And you are just trolling yourself. – No, something else is speaking us. We are nothing. – Nothing is strong. Sometimes it is unbearable, like immortality – “ils gémissent de leur immortalité et supplient qu’on les en délivre” (They wail their immortality and beseech us to deliver them.) Although it is the only thing we can take and only in it we find deliverance, in the midst of this world, the next. – Distrust in any metaphysical ground coupled with the sole trust that one is an emptied self clung to this horror-world like a rag hanging from a nail. So much existence has receded from me that my “thrownness” into this impossible “to be” disappeared faster than the world. One cannot die because one is not truly alive – “elle ne mourra jamais, elle n’est ni morte ni vivante” (she will never die, she is neither dead nor alive), yet a world insists on clinging to my inexistence. A world hangs from my nothingness. This wind-world keeps blowing, stirring the desert of myself, I, living “relic from the future.” (FF) To disclose myself, I have emptied myself and my thinking is the pinnacle of my inexistence. – You seem convincing, but these are certainly not your thoughts. It is that useless hive-mind. – Could you trust your state of mind for a while? – I trust neither states of mind nor statements of the mind. – Then you are sick. – “Normalcy itself is a mode, a subspecies of psychosis.” (SZ/FWJS) I am inhabiting my limbo-hell of perceiving self-perception as self-destruction. Existence as the sole fact that I am in the sense of my ur-quality as ‘existent,’ while all other facts of being have vanished like a carpet pulled from under my feet. A hell-limbo as both indefinite and horror region, the limb, the line. A fuzzy border that cuts: what is – cut – what is not. I am dwelling in this enormous cut-wound, bigger than myself. I – a limb, a border, a line. Space begins with borders, I begins with the 1 of individuation. For Immanuel Kant the space is created by the symmetry of the body, by the stretching of the limbs to opposite sides. I, 1 erect as the verticality of a trunk. Not-I, no-1, the forest has flown away. The sylvan world left hanging by a sole thought-stump. Impossible walk on the severed limbs of inference, limping-thinking. – These were my words, weren’t they? – They are neither your words nor someone else’s. It is just by chance that they happened to you as much as they are happening to me. They linger somewhere in the cloud of the unuttered. Not only am I not the predicate of thinking but thinking is in a relationship of negativity with the I, both to use it as a hypothesis and to destroy its existence altogether. Self as junk or as hypothesis, however you like it. Not “I think therefore I am” but “It thinks because I am not.” Humans are led to the thought that thinking itself is inhuman. They are also led to thinking that they themselves are inhuman. It shows that thinking is at place in humans while utterly displaced, so that when humans think thinking, they are thinking horror through being nothing. And when thinking thinks humans, it is thinking nothing through being horror. – Nothingness-monomania is the melodrama of the enormity of thought. – Nothingness delirium: hole bigger than the whole. – Am I suffering from I or from you? – Neither of these. “It” is suffering from every “I” that thinks in “I’s” and “You’s.” People are terminally diagnosed with pronoun delusion. – Are we for real? – No, only real is for real. – Omnipotence of thought to the power of nihilism. 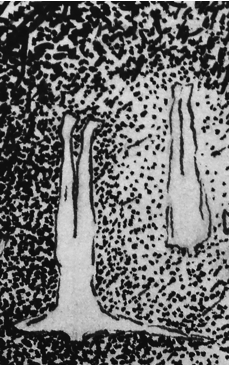 – The torment of not being able to be done with yourself, because you are suspended like Ligotti’s puppet, hanging from a malevolent string, swinging in the rhythm of an ominous creak over the bottom of a reluctant doomed world. The end of correlationism waiting for time to happen at once, for the inconstancy of inconstancy, for the awaited contingency to set ablaze the last string of salvation. To untether intelligibility from sensibility means both a severing and an appalling reconciliation: the sole intelligibility is that of horror, of oneself as an etheric yet too-consistent reflection of the void, as if one irreversibly swallowed an analgesic against what in a deep past was the sensibility of being-in-the-world. – How long will the environment resist the attack of “I”? “Endurance of an organism is a form of patience of the environment.” (IS) Anonymity that resists the attack of names. The amorphous that holds against the tyranny of form. The uncut self versus the escalation of the one. The open-source that opposes the concreteness of a name. – A detection that de-tects by moving away. Tailing the unknown to find more “un” than “known.” Being the detective of one’s own life is to place oneself in the center of absolute futility, to make ennui a lifelong obsession. To be bored of oneself to the point that you are bored of your boredom. –La personne de moi-même n’est pas une dame, appelez-moi mademoiselle, s’il vous plaît. –Je ne sais pas votre nom, veuillez me le dire? –La personne de moi-même n’a pas de nom: elle souhaite que vous n’écriviez pas. – Je voudrais pourtant bien savoir comment on vous appelle, ou plutôt comment on vous appelait autrefois. – Je comprends ceque vous voulez dire. C’était Catherine X..., il ne faut plus parler de ce qui avait lieu. La personne de moi-même a perdu son nom, elle l’a donné en entrant à la Salpêtrière. — La personne de moi-même n’a pas d’âge. ( – How are you, madame? – The no-one of myself is not a madame, call me miss, please. – I don’t know your name, could you tell it to me? – The no-one of myself has no name: she wishes you didn’t write. – I would nevertheless like to know what your name is, or rather what your name was in the past. – I understand what you mean. It was Catherine X ... we shouldn’t talk about what has taken place. The no-one of myself has lost her name, she gave it away by entering Salpêtrière. Madness, of course – but had I not now stumbled into a nighted world as mad as I? You love-craftian hero! You have resurrected the fossil of myself, the one that I cannot experience but that is speaking through me, seeping into my lack of words! The monster is here and I cannot stop it, I don’t want it ever to shut up. Whatever happens in this life it will be the fault of this cataclysmic “now” screaming to me, deafening me with the echo of a deformity that I always was. In thinking I am walking “the treadmill of myself” to discover that immobilized “Cyclone” (JT via GB) buried deep inside, slumberous soulstorm from outer space. In thinking, I am chanting my own obituary. A dark mass of stellar junk is resonating in me: “indeed the whole primal age and past of all sentient being continues in me to invent, to love, to hate, to infer. I suddenly woke up in the midst of this dream, but only to the consciousness that I am dreaming and that I must go on dreaming lest I perish.” (FN via GB) The benighted universe is dreaming me, that “me” that is dreaming a consciousness. “I” is a recursive dream. Blindly my thoughts follow the irreparable veins of a nestedness that screams the fossilized nothingness that is my consciousness. An ancestral and unknown force pulls the chords of a voice that I never had. A howler-voice of long accumulated xeno-strata. I am the hyperdiligent stenographer typing the echo of a disheveled, anonymous thinking that hits the cave-walls of myself. I ride on asymptotes, waiting to collapse under the terrible weight of the darkness of my thoughts. I am as remote from myself as from the last dying star. An infinite black wildness moans without a sound in my dwindling “I,” my gravitational flesh is unfurling a malefic time onto a perfect now of absolute self-oblivion. My absentmindedness uncovers a profusion of mineral thoughts that hang like stalactites from the ceiling of my mind. One syncopated drop of this alien matter can instantly open a large crevasse in myself where I will meticulously stay hidden. And I am saddling up the cusps of NOW. Now is the timescale collapsed into the space of a body that is both a place and its dislocation. Nothing coincides with itself. As much as we embody our own extinction, we also conceal the arche-fossil within ourselves. “Whatever secret the Earth conceals is also concealed within ourselves.” (DT) The materiality of our bodies witnesses itself through us as a “dark background of existence.” (EL) “I am obscure even to myself.”(CL) The self, “the cage of interiority” (TM) is the place where exteriority is latent. If “[t]ransparency simply means that we are unaware of the medium through which information reaches us” (TM), then transparency is another name for darkness. The “phenomenal self model” is far from being a safety tunnel for our ego. In this hermetic dark passage where the first obscurity becomes the self, the first to be effaced is the very foundation of our existence. Groping in the darkness of ourselves, we become nothing more than a dark mirror of an indifferent world, reflecting its own reflection. “The world looks at itself in me” (CL). Horrified by the source of cognition, I still drink at the fountainhead of my monstrous thoughts. A dark river is flowing through my being leaving me all silt, a turbid sediment of impossibility. I see in me a fossilized future and a resurrected past because I am nothing. I heedlessly “go on signifying,” (DA via GA) I sculpt words in flows that burst from a valve unknown, a valve that is pumping in the rhythm of my heart. As Robinet, “I am persuaded that fossils are alive.” “For every form retains life, and a fossil is not merely a being that once lived, but one that is still alive, asleep in its form.” (GB) Thought retains in itself the fossilized specters of geological strata that can only be accessed by absentmindedness. Behind my most limpid inference lies a “black knowledge which festered in the chasms of my subconscious.” (HPL) A thought that feels itself thinking is writing the partiture of its own silence. Thought is alive but its coffin is buried within it. A live thought drags its own coffin along, a dead thought is pulled by its very casket. If we are carriers of a clandestine mineralogy manifest in its slumber, then the most alive of all fossils is the fossil of reason’s inexistence. To produce a dead thinking is to discover that death of thought is ingrained in the matter of thinking itself. Inexistence hides in a deep strata of existence lurking upon us from a future that will be past again. “Nothing human makes it out of the near-future.” (NL) And I am still licking the wounds of my thoughts. Și pe morți cutremurul i-a deșteptat. This human trembling, the amplification of its grief is translated back to a geotremor. Earth and body are terminally linked, their non-coincidence overspills into one another. Body and earth: communicating vessels of alienation. The collective human grief, a tectonic mourning, is so moving that it makes the planet tremble and scares the dead out of their tombs. In horror, one scares the death of thinking out of its fossilized shell. The burial story of trembling and earthquake restores death at the epicenter of thinking. Being scared to death resurrects the negativity fossilized in the matter of thought. The fiction is real and happens in horror, in the most banal and unspectacular horror that “restores us to the negativity of existence as if nothing has happened” (EL). The trembling earthquake resurrection can be amplified as following: only by coming back from the dead is one really intelligent (the Romanian verb a deștepta– to awaken – means both to become smart/intelligent and to rise from the dead). The paradox of thinking: to grasp the wholeness of thought is to annihilate it. Intelligence embeds the intelligibility of its own inexistence and only by disappearing it can become fully intelligent. Genuine bootstrapping requires un-being. The orthodox funerary song Prohodulul Domnului, wherein collective human grief turns geological, frightening the dead out of their tombs performs exactly the opposite thought-movement at the core of Junji Ito’s manga story “The Mystery of Amigara Fault.” Here, a great earthquake, a tectonic stuttering of the soil, produces cracks in the exact shape of every human living on Earth. People are mysteriously attracted to these unforgiving holes and enter absentmindedly their assigned rock-tomb, finally disappearing inside the fault. The earthquake no longer awakens the dead from their tombs but opens up human shaped crypt-caves that absorb back to themselves the entire humanity. It is the call of extinction, the reality of which is fossilized into human materiality itself and is screaming our memory of dust. Thinking the cube “creates an almost exclusively bodily meaning” (CL) of its geometry. Form that melts into being. To be the cube one must give up oneself in favor of the cube. I have become more cube than myself. My being exists as cube. A four-cornered thought, inhuman. A flat thought, horizontal and vertical, banging its neatness on the four madly equal squares, too perfect, too parallel. The immurement of thinking. A thought creeping inside its receding corners, all at once. Thought-claustrophobia. Reasoning decays into the acuteness of the equidistant four points of the cube. Thinking trapped in its corners: pointilist singularity multiplied by four. Four corners become one, the cube collapses, the thought has vanished. A thought vanished inside the voidal prison of a cube, into a nothingness perfectly caged. Cubic cataclysm. Understanding fears imagination, imagination fears perception. Syntheses-horror. The cube is one of the available shapes of thought which through obsession-compulsion and fixation can produce catastrophe. But since geo-metry is the measure of earth, what new plasticity must thinking acquire in a time when the planet itself is retreating from its protective function as home? How are human thinking and affect being molded by extinction on a global scale? How does human thinking take the shape of its own inexistence? How is intuition active in a shapeless shape that is its own negation? If nature recapitulates thinking and thinking recapitulates nature, what kind of nature does a dead thought produce, what is the nature secreted backward by extinction? I want to feel thought thinking only what I cannot experience. “The personal is the geological.” (CC) The logic of the earth is alien. The personal is “it.” The only possible thought-movement toward the impossible is spiraled, madly encircling the nameless and unknowable. A thought that climbs on the spiral of its own ashes: a roundabout movement, a glitch-circle around its inexistence. Thought-plague, hyperesthesic dead thought, night-thought, hazy thinking, blob-thought, mold-cognition, intelligent ooze, autopoietic debris, smart nothingness, junk-appetition, void that thinks, shadow-thought, self-actualizing ghost-thinking. To think thinking-without-thought requires that geo-metry lose the earth, that one take the perspective of no perspective, the perspective of the redundancy of any perspective. A perspective that does not equate a point of view in the sense of sight, but a dynamic resultant of the semiotics of an environment that has always been indifferent – and now appears hostile only because we attached to it as to a home. A perspective requires localization, auto-detection, a pointing towards, its self-naming. Geometry is impossible even on earth. It is used as mere perpetuation of the absolute fog of metrics, measurement and precision. Geometry is born out of its lack of earth. “Geometry without earth corresponds to a measure of reality as infinitely attributed, as exceeding all possible sets of names” (NM). Geometry is an echo of no-metry. A perspective is the temporary individuation of an echo. Its coming to being reflects its stubbornness. Its possibility emerges against the ground of its impossibility. A perspective is a sound mirrored back by its environment, an echo abducted, abducting. It resembles the reverberation of a polyphony collapsed into a single thought-note, strange-to-itself. The echo-thought: noise-sound unintelligibly cognized. Roaring lullaby. Extinction is a supersonic thoughtboom. At the moment of collapse, it will be right within my earshot, as it always was. Everything will crumble, yet everything will be the same. In thinking thinking-without-thought there is a violence, a self-referential trauma of thought feeling more than it can think: “In the sublime thinking does a violence to itself. It feels more than it can think.” (SZ via IK) Sublime is the catastrophe of thought hitting the event of extinction as that of its never-having-been. What are the feedback and feedforward loops between reality and extinction, between thought and its inexistence? If imagining extinction triggers an experience of the sublime, how does this feed back onto our sensorium? Affect is the measure of a world held together by the gravity of extinction. We are just following the affective cues of a world approaching its doom. Thinking the Anthropocene is already happening, imperceptibly. “Before thinking, then, I’ve already thought.” (CL) The negative sublime of extinction is the interrupted thought, the blank, the delay “between the organism as a sensory-motor apparatus and the world that is (at least intellectually) mapped according to its own measure.” (CC) The abstract force of affect tweaks the gravity of thinking into a thought of life that takes the measure of death, into a thought of human scaled by its inhumanity, into a “will to power” of inexistence itself as the only impetus for all existence. “Signs don’t come from the mind. Rather, it is the other way around. What we call mind, or self, is a product of semiosis.” (EK/CSP) The inhumanity of thought is apparent in thinking thought as climatological semiosis. Thinking thought as noosphere rather than as a product of any form of individuality implies a feedback and forward loop between cognition and practice, between thinking and moving, navigating the environment. Any alteration of the climate impinges upon thought. The more the environment becomes unruly, the more the rule of thought reforms itself. The more we approach extinction, the more the time of thinking collapses and intensifies. If “the sublime is a cybernetic diagram that can be instantiated in multiple ways,” (SZ) thinking extinction is a mysticism of the “incomputable,” (LP via GC) an ever-interrupted affective calculus, an infinite recursion of what cannot be thought at the core of cognition. A superdeathspeed that silently mutilates the sensorial medium of our thinking. The event of extinction places itself on a diagram outside temporal causality. Extinction is the event with which one connects atemporally, mindlessly. Thinking climactically climatological thinking, both as extinction and as ecology, can produce nervous breakdowns, inferential collapse, a dense fog of reason out of which strange contingencies emerge. Points of cognitive catastrophe, thought-discontinuities, are retroactively produced by the end of human climate. The “tychean” (CSP) aspect of thinking becomes more and more apparent in this anthropocenic atmosphere. “Blows of chance” (L) hit a thinking that risks throwing itself outside of itself, an outside from the inside. We are trapped into the retro-action of the event of extinction creating the mental and affective possibilities that have led to it. In human eyes, the dust of extinction is presently glaring. Thinking as the reflection of your look in the eyebeam of impossibility, in the intelligent stim of the dark pupil of extinction. Thinking climato-logically requires the entanglement of climate and thinking. Climate change is an altering and alteration of a more comprehensive climate – political, affective, cognitive, meteorological. Thinking extinction is trapped in a double bind: extinction of the thought of climate and thinking as climatic logic of extinction. Extinction is a possessive force. Thinking becomes the pace of swooning into the nothingness of oneself, into the 0-climate of individuation. We are doomed and our (in)human thinking burrows its way blindly and indifferently toward its own non-being to leave a thinking more round and complete follow its inhuman path. Ah, but even doom is intelligent, hence doom is itself doomed! The paradoxical nature of anthropocenic thinking restores what was there all the time: an ontological negativity and a universal noncoincidence of matter with itself. Even “God is not fully himself ... there is something in God that isn’t God.” (SZ/FWJS) Nothingness is intelligence in its recursive renunciation of its will to be nothing. The void relinquishes itself. It is being more than itself through volitional fade. Its auto-superposition opens the wound of thinking that vomits on all the superlative brilliance of nothing. Nothing-intelligence is discharged from the suppurating impossibility of void’s coincidence with itself. Paradoxically, the clinamenial potential awakes in the more-than-empty sphere of renunciation. A more-than-silent intelligence has whispered this through me. The Lucretian clinamen, the unpredictable slight deviation of atoms falling through the void is a double thought-as-appetition: loss of appetite of the void that is gently, slightly devoured by the minimal gluttony of the falling atom, through its soft swerve. Thought is a self-actualizing deviation from itself. Thought; a double never-having­been. Thought has never – more or less – gone astray from nothing. Thinking thinks through me and in spite of me. I became a dark climatology of a beyond nearer than nearness itself. “We shall be inhuman – as humankind’s greatest conquest. To be is to be beyond the human.” (CL) I feel a propensity to leap and yet to remain in place for I am not. Extinction is nested at the infra-level and my thinking is hopelessly pitted with its inexistence. I am more ()hole than whole. In writing I am quoting you, I am quoting nothing. I am just weaving quotation marks around the nothingness of words. Thought does not illuminate the Real, but projects its own real shadow upon what it cannot see. … points of nocturnal space do not refer to each other as illuminated space; there is no perspective, they are not situated. In a cosmical staring at the world-without-us, the iconic black square seems to have enveiled the whole universe. The eternal night of a cosmos that excreted an accidental human world looms over the banal and familiar, even while basking in the sun. A void gapped into geometry (the measure of the geo, the earth). Every irreducible dot is the bearer of an infinite hole. In-finite is the body of the finite as black is the body of light. I cannot wipe away my night-thoughts, expectorate my existence, disarticulate the continuum between the whiteness of persistent bones and the bland error of my soft life. I carry darkness inside a body that is not even mine. This body-sac of darkness, fluid entrapment of anonymity, blind to itself, blind to its thoughts. The matter of darkness is boiling in silent night-bubbles. Pitch-lava erupting from the nano-volcanoes of my pupil – a pupil no longer mine but of night itself. In darkness I see my sight, I feel my eyes seeing, touching on nothingness. Culmination of sight: by the enormous dilatation of the pupil I become black itself. I am pure infra-noir. Introspection is a dark speleology of the vague being that is you. The cavernous inside is a blob of cosmic darkness. You and I – freak accidents of death. Our lethargy: melting the day into night each night, melting the day into night each day. Light is a wound of the night and we are the dark wounds of light. The night is a swarm of points creeping off the exterior to melt with what we are most sure that is us. We inhale the night and exhale spores of darkness, we feed on the fear ingrained in the matter of our very (in)existence. We are sweating waves of night while wiping the sudor of fear. Life is in us to germinate death.